I made them, halfway checking Malhu Manji’s cookbook and halfway winging it on the batter. We already had some cooked basmati rice so, feeling a theme here, I made some microwave palak paneer to go with it and had just enough time to nuke up a chunk of tamarind pulp in a bowl of water for a few minutes, blitz it in the food processor, scrape it through a colander to separate out the seeds and stringy bits (I know, this neither looks nor sounds all that pretty), stir in a spoonful of brown sugar for a quick tamarind sauce and nuke it another minute or so to get it the more attractive apple-butter-like dark reddish brown. That’s obviously more fuss than you’d want on a weeknight, and I’m not recommending it as such, but by then I was in the groove and feeling righteous and like I could do no wrong because the pakoras were smelling good. There has to be some time when it’s fun to be in the kitchen, right? If you don’t want the supertartness of tamarind sauce OR the fuss, these pakoras would actually be pretty decent with apple butter or chutney from the store, come to think of it. I was cranking along so well (and my husband and daughter were dawdling before dinner so much doing Mysterious and Important Things™) that I had time to grate an overripe tomato for a second chutney before my family caught on. We lit candles and tucked in. And the pakoras were, in fact, freaking delicious. Fast, fresh, spicy rather than too-salty, crisp and browned and not greasy. 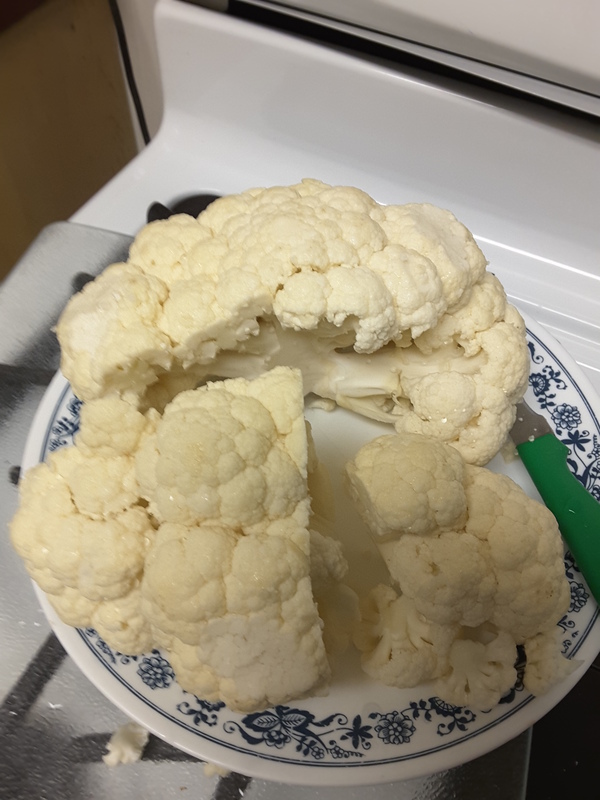 You don’t need a lot of oil or deep-frying if you precook the cauliflower in the microwave and use a nonstick pan. They’ll brown nicely with a tablespoon or two of oil for a plateful, and they’re a lot quicker than latkes. So they might not be restaurant-standard because the batter doesn’t puff up the way deep-fried does, they might not be technically all that healthy except in comparison with latkes or jelly doughnuts–but they won’t give you a gallbladder either. Whisk together everything but the water and then whisk in the water gradually but thoroughly until it makes a medium-thick pourable batter, as if you were making pancake batter. Let it sit covered 15-30 minutes or so to thicken up (it will). Stir it again and thin it back out with a little more water if you need to, just to the consistency of pancake batter. 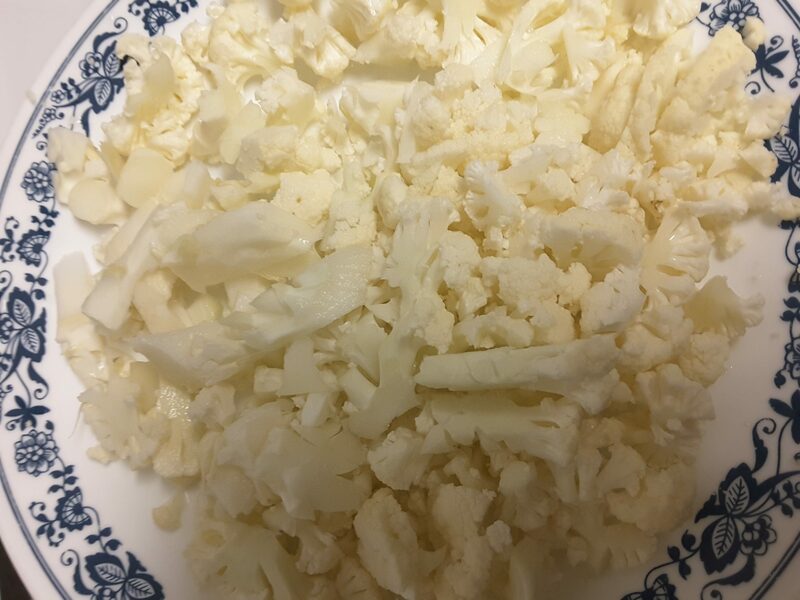 While it’s still resting, slice a couple of cups of cauliflower into bite-sized pieces, maybe a quarter to half an inch thick and an inch across. A third to half a large head would be about right to make a plateful of bite-size pieces, but you can use the whole head if you want more–there was enough leftover batter when I did half a head that it probably could have covered the rest. Microwave the slices on an open Corelle-type plate or in a large microwave-safe container with a lid for 2-3 minutes on HIGH to parcook them. When you’re ready to fry, heat a tablespoon or two of olive or polyunsaturated vegetable oil in a nonstick frying pan, just enough to coat the bottom. 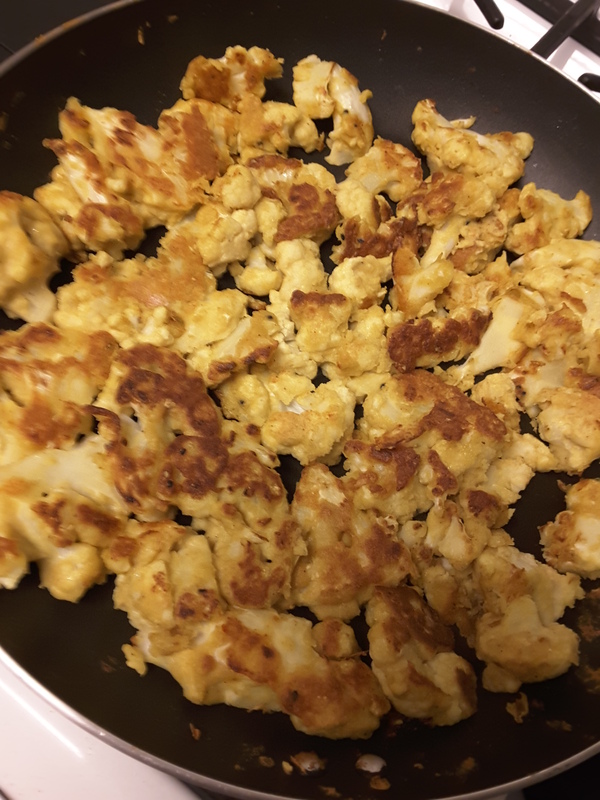 Pour some of the batter over the cauliflower chunks (use a big mixing bowl if you’re doing the whole head, it’s a little less messy) and mix with your hands to coat them thoroughly–add a little more batter as needed to coat it to your liking. If you use a whole head of cauliflower, you’ll probably need all the batter. When the oil’s hot and shimmering, fry the plateful of florets in a single layer, with space between pieces if you can (do two batches for a full head, or use two pans side by side). Let the florets sit a while until they start looking cooked on the underside. Flip with a spatula and let them sit again, perhaps with a lid on for a few minutes to help steam all the batter that got inside the florets, then open it up to crisp and brown the outsides to your liking. If you feel you need a little more oil, drizzle a spoonful or capful in drops around the outside edge of the pan and shake the florets in the pan to distribute it. I realize winter’s not the best time to recommend a fresh tomato sauce, so if you don’t have fresh tomatoes, go with a can of unsalted tomatoes and pulse them in the food processor to break them up. I learned this quick low-tech trick of grating fresh tomatoes for a sauce from Janna Gur’s latest Israeli cookbook in English, I think? maybe one of the videos on her web site, Al ha-Shulchan (On the Table). You can use the pulp raw or cooked–here I cook it lightly in a pan so it’s not super-thick and it retains its fresh character. You can flavor it a couple of different ways and make just what you need for the moment–for the pakoras, I used one large beefsteak tomato that was nearly overripe (we’re lucky, we have good tomatoes longer into the fall than most of the country). Roma tomatoes are fleshier and have fewer seeds (which I don’t squeeze out; they carry a lot of flavor). But they’re smaller and firmer and might be trickier to grate safely. 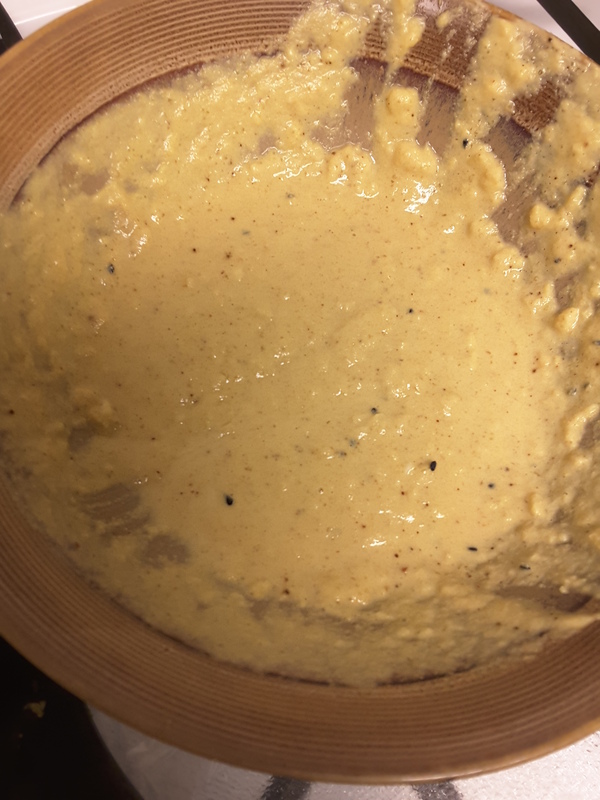 You might just take out the cores and purée those in a food processor, skin and all, with a little water or else just chop them and let them cook down a bit longer in the pan. Wash and cut the tomato(es) in half horizontally. Grate the cut side of each half on the large holes of a box or flat grater over a bowl. Hold your hand flat on the top of the tomato half to avoid getting your knuckles, and grate all the way to the peel (go slower toward the end for safety). Discard the empty peel. Heat a spoonful of olive oil in a nonstick pan, grate the garlic into it, and as soon as the aroma comes up and the garlic is just beginning to go golden, pour on the tomato pulp and let it simmer a bit. Sprinkle on the flavorings of choice and let it cook just until it reddens and starts thickening at the edges of the pan like tomato paste–about 5 minutes, maybe a bit more. The juice will separate out when you start heating the pulp, so stir the thickened stuff back in as it cooks down. B’te’avon (eat nice, mangia bene, bon appétit) and Happy New Year!